The universe of "Angel Devoid" is plunged into the future, at the beginning of the 31st century. The Earth, now called Terra, is only the shadow of what it was at the end of the second millennia, facing a critical over population and a growing criminality. After the melting of the polar ice caps in the 21st century, the Earth had lost between ten and eighty miles from its coastlines, causing many lands to disappear in the floods. Needless to say, the consequences were dramatic. What the floods left was an overcrowded world whose resources were no longer sufficient to feed and support it. With billions without homes, suffering from diseases and condemned to starvation, the only alternative left to the Aggregate World Government (AWG) was to turn towards space, and initiate a large scale colonization program. Thus was born the Martian Colony project. Fifty long years were necessary to transform Mars through terraforming into a colony capable of supplying Terra with raw materials, but meantime, at a frightening rate of forty million a year, over two billion people died on Terra while awaiting for better times to come. While the Mars colony was building up from the ground, new technologies were developed on Terra in medical, scientific and transportational domains. This led the Mars colony to become for millions, the same promised land that America was for the Europeans of the 16th century. However the massive immigration that followed had disastrous effects on the terran economy whose depleting financial resources caused many bankruptcies and led to a global interdiction of credits and loans on the entire planet. The Mars colony was thriving and prosperous. Raw materials were being sent to the Moon through a titianesque magnetic rail, in which the enormous rocks were accelerated until they reach the speed required to escape from Mars's gravitational attraction. After weeks of travel through space, the blocks reach their destination, the Moon, where they simply crashed on the surface. Then the miners from the Lunar Project Conglomerate (LPC) had to dig out the minerals, send them to refineries where they were treated, and finally forwarded to Terra with a smaller version of the Martian magnetic rail. For years, the Mars colony continued to supply Terra in the same way, until one day the colonists claimed their sovereignty and at the same time stopped all shipments towards the Moon. Among the miners of the LPC, this decision was interpreted as a betrayal, and they vowed vengeance against the colony that had left them behind to an uncertain fate. Turning back the accelerators towards Mars, the miners sent back the huge rocks from the last shipment to where they belonged. Helpless against the threat, the colonists had no other choice than to take refuge in the underground network of mines from where they witnessed the destruction of their cities. Under pressure by the Martian partisans, the LPC dispatched an army to stop the miners from continuing their aggression. However, what was meant to stop the war against Mars, made things even worse. After only one day spent on the Moon, the army equipped with giant robots and biological weapons, commonly called BIO's, left towards Mars to reconquer the rebellious colony. On Mars, they had to face the soldiers of the Death 7 company, led by Angel Devoid. Although there were many losses in the Martian camp, Angel Devoid brought a short period of victory to the camp. The BIO's had infected the atmosphere, and hundreds were already dying from what it is called today, the Reiter's Syndrome. Martian scientists were prompt to find a solution to counter the effects of the lethal disease, but with the threat of a imminent second invasion, the colonists chose to leave. They fled to Terra on-board a fleet of transport ships and shuttles which was intercepted on its arrival. Many were sent to court for their participation in the war, but contrary to all expectations, Angel Devoid was acquitted. The others who were not sent to jail, were condemned to a certain death as the Egesis IV, the cure to the Reiter's Syndrome, was infringing the Terran DNA laws and only available from the Terrain government. This put an end to the episode of the Martian war, at least this was what everyone believed. With Angel Devoid promoted to Chief of Paradise City police by the Mayor, rumors started to circulate that he had something to protect him from the Paradise City government. Even when it was said that his actions against people from certain corporations were not justified, the Mayor made sure that they remained rumors and didn't engage any pursuits. Although he was suspected in the bombing of the police headquarters, it is only when Angel Devoid killed the Mayor in front of the media that he became the most wanted criminal in the city. The above lines resume the series of events that happened prior to the beginning of the game. You will find the complete story in the manual, and I strongly recommend you to pay attention to every detail that is mentioned. It won't help you to solve the puzzles during the game though, but at least, you will read another story about Angel Devoid than the one you can learn from his current criminal records. After all, one knows more about a man from his past than from his present. The character you will play in the game is a police officer named Jack Hard. After you miraculously survived the police headquarters bombing, allegedly attributed to Angel Devoid, things became personal between you and him. "Putting an end to Angel's activities and his life eventually, would be the best thing that could happen", you thought after you recovered from the blast. I guess you could call this revenge. The introduction of the game will explain how you got badly hurt in an accident while pursuing Angel Devoid across Paradise City. What you peered in a semi-consciousness, were the sole images you kept intact from the accident. First, there was your burning vehicle lying on the ground, then Angel approaching your mutilated body, whispering cynically about a doctor who was going to 'fix your face'. Later when you reopened your eyes, the face of a surgeon appeared only for a brief instant, before the anesthetics took effect. The game truly starts when you awake from the operation in a hospital room. Everything would be just fine if the nurse taking care of you, didn't suddenly run away from you, crying aloud you were Angel Devoid. What is going on here? Moving toward the mirror placed on the right side of the room, you can't believe what you really see. How can things like this happen? You no longer look like Jack Hard, and instead you could be Angel Devoid's twin brother! As the nurse probably called the guards, you would be better to move quickly out of the room if you want to stay alive. With such a face, you won't have time to give any explanations, and should you have a good one, it is not likely that it will be convincing enough to stop the guns. You will only have a short time to take a decision before the guard enters the room, identifies you as the hunted criminal and fires his weapon. Your movements are controlled via the mouse cursor, symbolized by a swirling blue circle on the screen. Whenever you move the cursor over 'hot spots', the cursor will change to indicate possible actions. If it shows an arrow, it means you can go in the direction of the arrow, while a ladder is a sign that you can go down or up. If it instead turns into zooming crosshairs, it means you will be able to interact with the object. Once you choose a direction, you will see the scene through the eyes of your character exactly as in "The 11th Hour", except that the screen is slightly larger in "Angel Devoid" with a small interface at the bottom. The video in the game features the same kind of 'interlaced' graphics typical in mid 90s releases. Very quickly into the game you will find a weapon. To choose a particular object from the inventory, use the small arrows to scroll to the left or right, and select the item. A blue square will then appear around the object indicating you now have it in your hands. As you can die from thirty different ways in the game, I had the gun selected at all times for my own security and it paid off! Just to defend myself, I had to kill no less than three people within the first twenty minutes I played the game. If you are not careful enough, you won't have a second chance, and unless you saved often, you will have to start the game over from the beginning. The big difference between "Angel Devoid" and most of other adventure games, is the rapidity of action the game requires. You already have an idea of what you can expect at the hospital, but it is only a beginning. Fortunately, the game is not only made of these action sequences, and there are many other scenes where you must find objects and talk to other people. 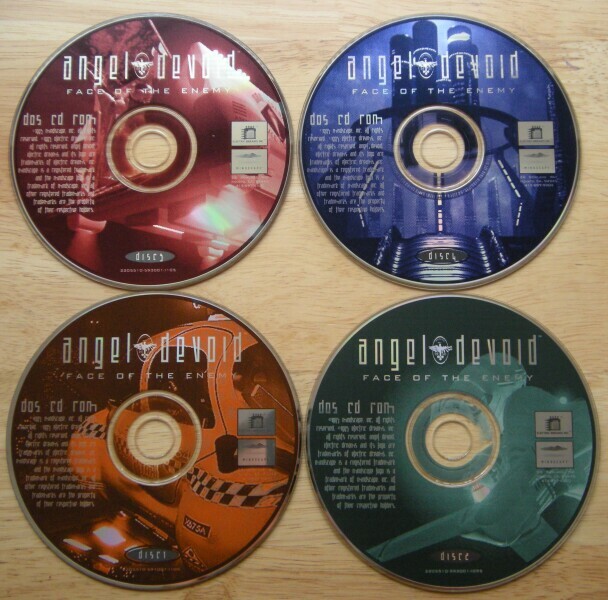 The dialogues in "Angel Devoid" have been thought differently, and instead of offering a choice of sentences, the program lets the player select his or her mood to talk. You can choose to be aggressive, normal, or passive, each mood being represented by the corresponding skulls: Devil, Normal and Angel. When you see the small box with the three skulls appearing on the screen, you must select one within a given time. If you don't, the normal mode will be chosen by default. The choice of the mood is important as people will have different attitudes. Choosing an aggressive response might inspire fear for your interlocutor, forcing him or her against their will, but it doesn't mean you will be in a safer situation. On the other hand, a sympathetic mood is not guaranteed to open all the doors for you, and it finally depends on the character you are talking to. In every case, stay on your guard as anything can happen, even the most unpredictable, and just like the 'X-Files' motto says, trust no one. The I-Net icon in the interface will allow you to review a short biography of over two dozens of characters you can possibly meet in the game. While it was interesting to learn more about specific characters before approaching them, it was totally useless for the different types of robots. The difficulty in "Angel Devoid" doesn't really come from the puzzles as there aren't many. It is more a question of timing than anything else which makes the game a hybrid of an adventure and action game. However, the action part is, in my humble opinion, too preponderant in the game. Other than dialogues, you can only follow limited paths around that lead to various places such as bars, a casino, metro station, church, museum, and even a hospital. All the different locations feature great graphics, but apart from the characters, you won't find many things to interact with except in the casino. Besides the navigational mode described above, the game also has an info mode represented by a magnifying glass. Switching from one to another is very easy and is reduced to a simple click. It is unfortunate though, that the use of this mode is nearly nonexistent as I can only remember using it once in the whole game. The other tool to provide you with some information is the PDA, your Personal Digital Assistant who is portrayed by a young woman. She can read your mind whenever you speak or think, warn you about dangerous situations and even give you advice that is wise to follow. She will also provide you with details about what you are carrying when you right click an item in your inventory. This will give you a brief description while a 3D representation of the object is displayed on screen. With its solid graphics, remarkable animations and a well-conceived scenario, Angel Devoid was a success.